This oddly named recipe is courtesy of BBC Good Food. I don't really understand what's wrong with calling it Spaghetti with Chorizo and Peppers? Because that's all it is in essence. Life is busy with the candle being fully burnt at both ends. I feel I barely have time to breathe some days with juggling a full time job, motherhood, wifehood, running and this cooking blog nonsense. Tomorrow I'm having to get up at 4am to fit in a five mile run so I can still be at work by 7am, work til 5pm then home for another round of bedtime, dinner and blogging. And they call this Women's Lib? I guess thirty years ago (excluding the technological advantages) I wouldn't have been able to have the satisfaction of gradually trying a new recipe every day as the resources just wouldn't have been there. I'm only in the privileged position to do this because I work full time. Anyway, enough with the self pity. To me, spaghetti should always be served alla ragu (or with a bit of Bol) or with rather tasty meatballs. Failing that, it makes an excellent snack simply buttered with lashings of black pepper and parmesan. You can keep your carbonara. It just doesn't do it for me. But as I'm running tomorrow, I wanted a quicky, tasty pasta dish to sustain me as I won't eat when I get up in the morning. Or at least that's my excuse. It's carb-loading, okay? So I turned to BBC Good Food to help me make something out of the limited contents of my fridge and larder (two days to Ocado arrive and counting!). And this was what I got. 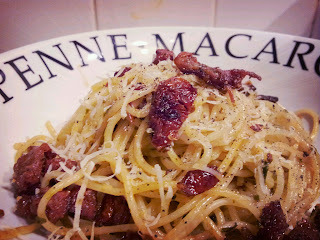 A tasty pasta dish that was quick to make (and sadly even quicker to eat). I used dried pasta. I didn't have fresh parsley so used Garden Gourmet. I think this is the one bit that could be improved on by using real herbs as you just didn't get those little parsley flavour spikes like you would with the real thing. This will now be my new quick pasta dish of choice for evenings when I want to pack in the carbs but don't have hours to cook - and can't convince the hubby that it's good to have Spag Bol for the third time in under a week. As for the flavours being Spanish? Well it tasted of smoked paprika from the chorizo so I guess it can just about get away under the trades description act. But only just.